Opposition to PSEG Long Island’s ongoing upgrade to electrical transmission lines in East Hampton Town is intensifying. Over the last week, residents of McGuirk and neighboring streets in East Hampton Village have taken their grievances to meetings of the town board, the village board, and the Amagansett Citizens Advisory Committee. They have retained and directed a law firm, Tarbet and Lester, to seek an injunction and are imploring fellow residents to call elected officials to insist that work be halted until their concerns are vetted and addressed to their satisfaction. As of yesterday, said Jack Forst of Newtown Lane in East Hampton, approximately 625 residents have signed a petition opposing the project. Though town and village officials, some of whom are no longer in office, granted permits for the project in the fall, they are now trying to determine what, if any, standing they have to halt the project pending additional review, and whether local laws or the town’s comprehensive plan could have come into play. “Having said that, the question becomes, was that done legally and does it comply with SEQRA?” Mr. Cantwell said, referring to the State Environmental Quality Review Act. Councilman Peter Van Scoyoc said that Stephen Lynch, the town’s highway superintendent, issued road-opening permits for the project. For similar instances in the future, he suggested that the board look into changing legislation or procedures to ensure that before such permits are issued, existing laws and guidelines, such as the Scenic Areas of Statewide Significance, state-approved legislation designed to protect areas that are deemed significant vistas, come into play. That, said Mr. Van Scoyoc, would be “an additional trigger” for further review, so that the permits are not issued administratively. 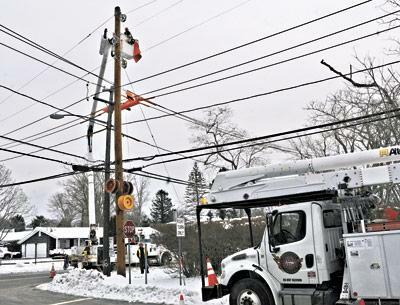 In a project the utility’s officials say is essential to ensuring reliable service, PSEG is installing new 23-kilovolt transmission lines atop wooden poles, some of which are more than 55 feet tall. New poles have been erected along Town Lane in East Hampton and Amagansett as well as on narrower streets including McGuirk. Residents fear adverse health effects from the transmission lines’ electromagnetic fields and a chemical preservative that is injected into the poles. They also decry the impact on their property values represented by the new infrastructure, and the harm they said it is causing to their neighborhoods’ character. The utility’s officials have offered various explanations as to why routing the new lines along the Long Island Rail Road tracks, where existing transmission lines run, is impractical. They have also said that burying the lines would be too expensive. Jonathan Tarbet, of Tarbet and Lester, addressed the board and discussed a prior case that the residents feel will support their position. In 2008, the Town of Southampton sued the Long Island Power Authority, charging that LIPA had not included it when preparing an environmental impact statement prior to its planned placement of transmission lines in Water Mill. Residents objected and insisted that the lines be buried. An agreement was reached between the town and the utility under which a section of the lines was buried. Residents are absorbing the cost of burying the lines, which added $11 million to the project, through their utility payments. In September, however, LIPA sued the town of Southampton, claiming it is more than $200,000 in arrears. Becky Molinaro, the village administrator, said that, unlike Southampton, the village is not the assessing and property tax-levying authority in the town, so the town would likely have to be involved should a similar resolution be reached here. “What’s going on on McGuirk Street is tragic,” Mr. Cantwell said at that meeting, describing “a beautiful little residential street with small lots, a close-knit community, houses very near the street.” He agreed with residents that transmission lines in that location should have been buried. “We should have a resolution of concern and support asking our town board to do everything they possibly can to represent us in this situation,” said Jeanne Frankl of the Amagansett Citizens Advisory Committee. Members voted unanimously to send a letter to the board opposing the existing plan and asking for one under which transmission lines would be buried.